Cute outfits that will keep you warm in winter can be tricky for us in the midwest. It's cold. The wind blows and cuts right through you. The snow can be slushy and wet. Our winter style at some point will include puffer coats, chunky snowboots and layers! When the Homie invited me to go check out the Chinese New Year Parade, I was already shaking my head no in my mind! You know how I feel about cold weather. Standing in the cold on purpose? No ma'am. I do like to step outside of my box though so I agreed. I wore multiple layers to create a casual and warm but cute outfit. If you don't agree, keep it to yourself. I thought I was cute! Put on a camisole or t-shirt underneath your clothes. Wear long underwear if you have it! Wear tights or maybe even both if you're wearing a pants or long skirt. I'm pretty casual as I was going to stand around and look at stuff but your date night dress or girls night out mini could be here too. *The boots are ugly but red and have a little heel giving me some height plus they're amazingly comfortable. There's great padding inside that feels like a foot massage when you walk. No joke. If it doesn't quite go with your ab fab outfit, make it a cardigan so that it can come off with the coat easily. If your hair is long enough, wear it down and over ears. Make sure your head, hands, and neck are properly protected. *My hat has an adorable flower (shoutout to the rockstar crochet Empress Camie). I like a little lot of flair. Don't you? My purse was super handy and functional for the large crowds. It rests right in front of me like a fanny pack and I can get stuff in and out of it without taking my gloves off. It's also purple. 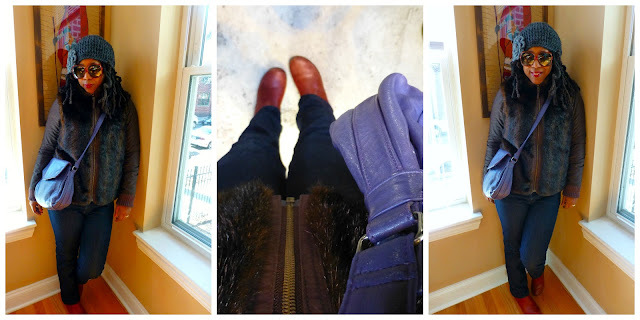 I like pairing the red boots with the purple bag. Red and purple is one of my favorite color combination. I think I may have found the the most perfect, warmest casual outfit ever. I stood outside for over an hour and did not have any teeth chatter. I kept my hands in my pocket when I wasn't taking pictures. I also found a sunny spot and busted a move to Gagnam Style every time it was played! What's your keep warm in winter style? This is the last day to enter the handmade pouch of goodies giveaway! Good luck! I have to layer up too & when it was snowing even had to break down & wear those Astronaut type boots! They had studs on the back so they looked great & kept me warm & dry. Your crochet hat is beautiful! Layering is clutch! Love the green on you! Fun stuff, keeping warm in style for real!! I love the beanie too. You and Chandra are working the beanies today! Your accessories are on point! Blog hopping from The Pleated Poppy. Thank you for spreading the word about layers. I wear thermal leggings November to March/April, either over one pair of regular thick cotton leggings or between two pairs of leggings. I also wear a long down coat and high boots with boot socks. Silk pullover sweaters are another secret weapon against cold. I love how stylish you make keeping warm look! Love the hat and faux fur!!! Love the red with purple too! I love this look! The hat is fab! You look so chic yet perfect for cold weather! The way the weather has been, I say add about two MORE layers! Super cute faux fur. My mom use to rock one like that and she got rid of it. Not that I fit her stuff, I'm mad she got rid of everything. Very cute :) I love the look of sweaters over button downs, and you were right to get bundled up. You will NEVER catch my volunteering to spend hours in the color. But if you're going to do it, you may as well look fabulous, right? tres cute! and i am so with you on the layers! and yes, the more flair, the better! Really cute look, I love that green sweater!! Layering for me is a hit or miss (mostly miss), but I keep trying lol! !